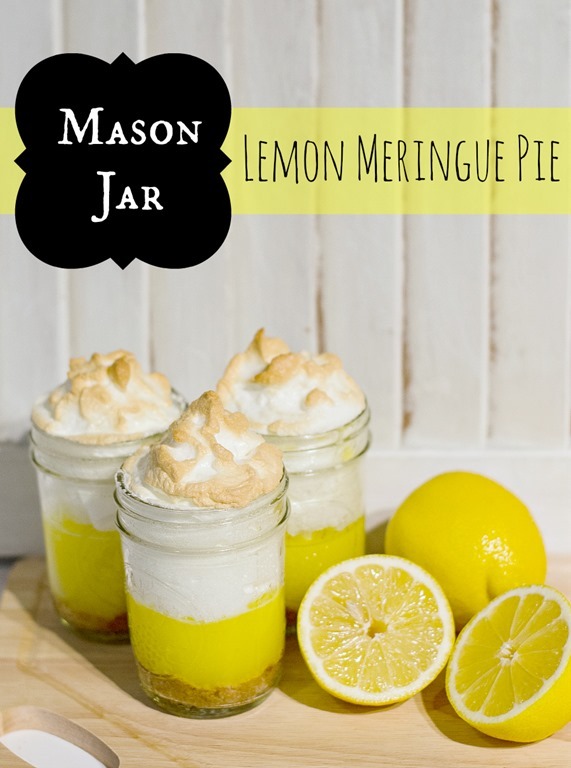 Mason jar lemon meringue pies recipe. It’s a rare occasion when the family gets excited about a blog post. Okay, that’s not exactly true. They’ve never gotten excited about a blog post. In fact, it’s typically the exact opposite. 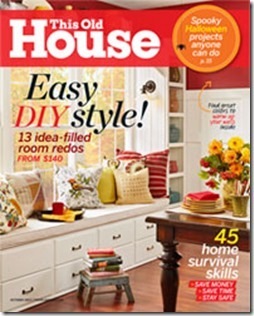 My blog posts often involves displacement of their things – or them – as I work on a project or a photo shoot. But this time? This time they were intrigued. It all started when my son spotted the Jell-O lemon pudding box. I mean, who doesn’t get excited at the sight of a Jell-O box? That’s right, I told him. I’m making a spring dessert favorite. Lemon Meringue Pie. With a twist. 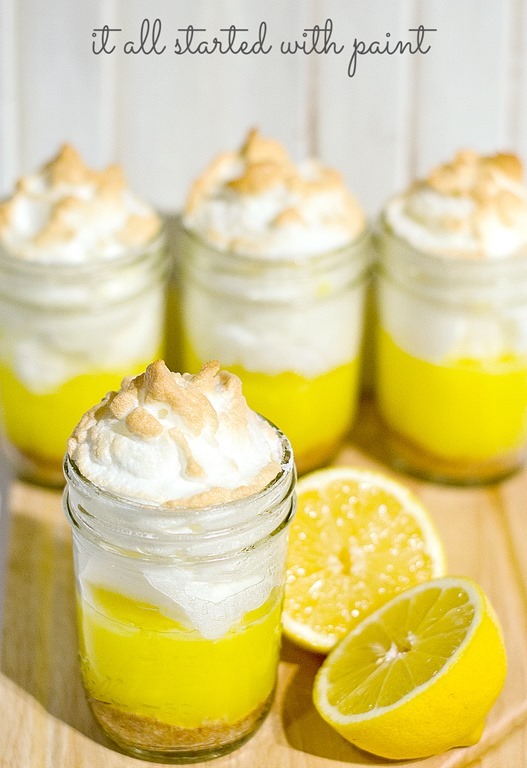 … Mason Jar Lemon Meringue Pie. I crumbled the graham crackers in a Ziploc bag and then added in the sugar and softened butter. I mixed it up by hand and pressed into the bottom of the mason jar. I baked at 350 degrees for 10 minutes. I simply followed the instructions on the Jell-O box for the pudding and meringue. Just be sure to get the “Cook & Serve” variety. This won’t work with the no-bake instant pudding. To Make the Meringue: Beat together 4 egg whites and 1/2 cup of sugar. Beat until form peaks. Layer on top of jars and cook at 350 degrees for approximately 10-minutes. Turn off oven. Tip: To prevent glass from breaking, let jars cool down in oven before removing. The best part? My husband thinks I’m some sort of creative genius for putting this recipe in mason jars. Thankfully he’s not on Pinterest. I honestly think it just may be time for a intervention. Seriously. How many did it make? I do have about ten empty Mason jars just waiting to be filled… YUM. YUM! love this in those glasses too! Quick and easy clean up! OMG you are too funny! I was do jealous at first when I read that it’s a rare occasion when you’d family is excited about a blog post as my family never is, but when I realized you were joking I felt much better. Oh and the part about your husband not being on Pinterest, mine doesn’t even know it exists! 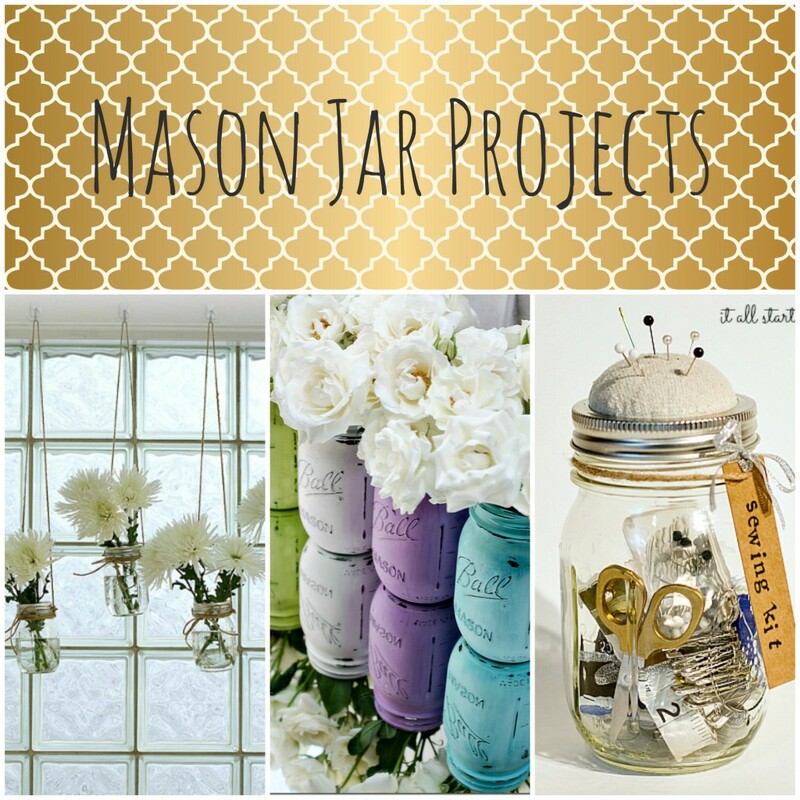 These are great, I have to try them, out to buy some mason jars..
Oh my gosh these are beautiful! 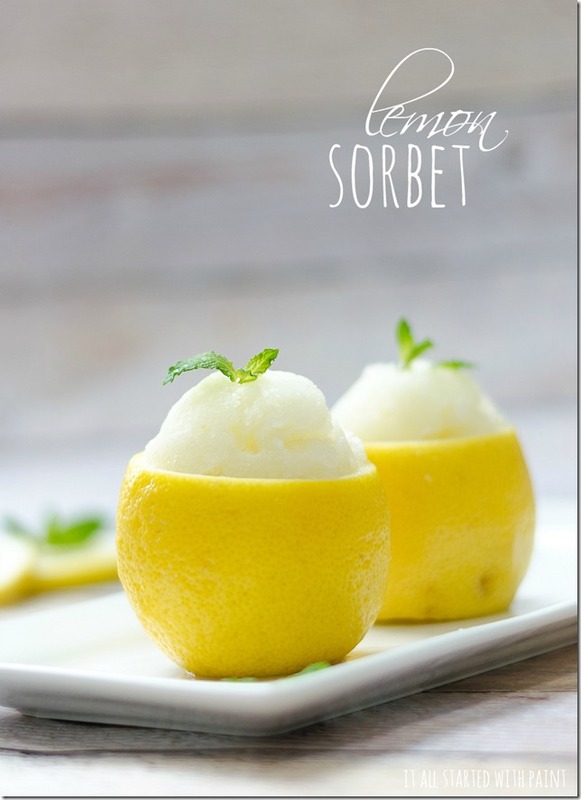 I love anything lemon…and mason jars? Love them too. Hope you have a Happy Easter! You let them eat the post product? You have created monsters now. Beautiful! I’ve been so drawn to yellow as my spring accent color this year! 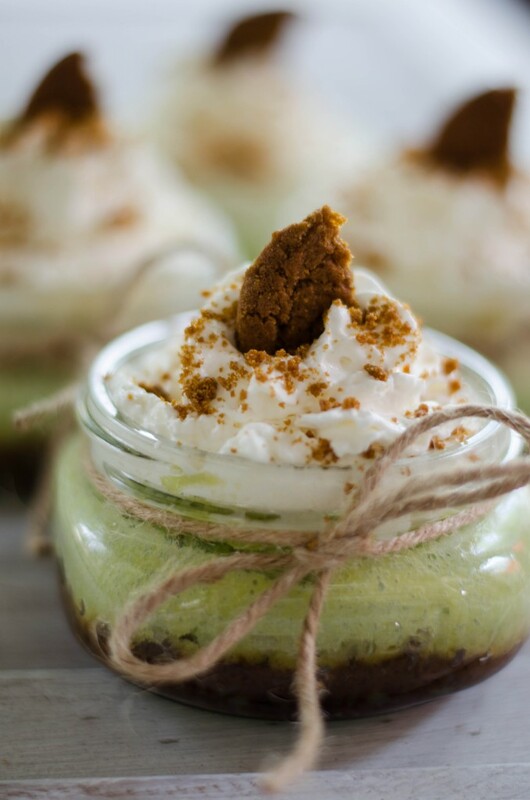 And you have me thinking of making a dessert in mason jars that I’d like to make! Ummmmm, I just had dinner … and dessert and could totally eat a couple of those Great pics!! You’re so funny! Great idea and they look so pretty… pretty enough to eat! LOL So how long was it before you didn’t have any pies left to take photos of? I’m sure your family wolfed those down and I would be right there with them fighting over who gets the last one! Oh this is WAY too fun. Once you plop something delicious in a mason jar, I lose the ability to resist. Fun idea! How cute and a great presentation. Oh my goodness they look delicious!!! So beautiful and yummy looking! Pinned! These are so cute and I bet yummy too! I love lemon meringue! 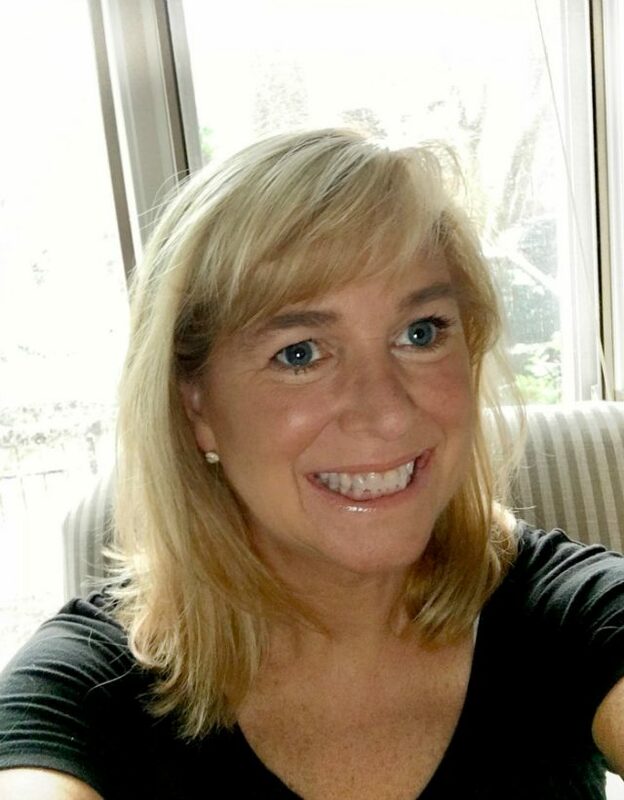 I would love for you to share this on my weekly link party Blog Stalking Thursday. Thanks for the inspiration! Great idea for a picnic! Visiting from Stone Gable Cottage. These combine two of my favorite things… yum!!! How did you brown the meringue? Did you put the jars in the oven? Pinned these for future reference – thanks for sharing! Yes! I would love to know, too!! Talk about craving… yes, this is at the top of my list at the moment! I pinned this the other day and didn’t have a chance to come by and say thanks for making me think about them for the past week! 🙂 I NEED lemon meringue NOW!!! They are too pretty to eat!! 😉 These would be wonderful at a summer party. Thank you so much for sharing. They are so lovely. Seriously, I am not trying to come up with some event I need to serve mini Lemon Meringue Pies at! Thanks for sharing. Oh wow! These look so delicious! I lemon meringue pie but putting it into little jars is just genius! So cute. Thanks for the recipe and idea. Wow Linda, they look BEE-U-TIFUL!! THIS I have to try. And my family will get excited too! Your meringue looks perfect. I’ll bet it was delish too. You go girl!! I’ve looked at these all week, and each time I see them my mouth waters, yum…I’m featuring this post on Be Inspired this week, great photos too, thanks so much for joining in! The Meringue Pie looks super delicious! but I really need to run and buy that 50mm lens. Again, amazing pics! 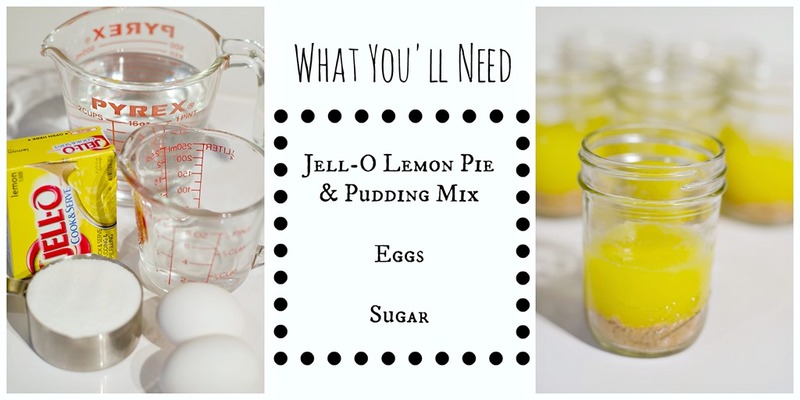 Two of my weaknesses…lemon desserts and mason jars! Perfect! I am hosting a “Pin it Again” link party at: http://mylifeasrobinswife.com/. Please stop by if you have time. 🙂 It is live now :). Oh my goodness. I want this now. Lol. What a great idea. I need to buy some madon jars. Look yummy, but could you give some details – how many jars to buy, how you did the meringue, etc. Also, could you possibly put the recipe in print out form for when I go to the grocery store so I can be sure I get all the ingredients? Thanks!! Great idea for my next ladies luncheon! I’m drooling! How many Mason jars you need? What size? How much filling do you put. In each jar? Don’t tell ego just divide the filling into such and such number of jars! Whenever a recipe tells me to something like that I always end up with uneven quantities! Just don’t have a good eye for that kind of thing! Where’s the recipe for meringue?? This is just a cheap way for making it–use the real thing next time, and you will be ‘wowed’ Have been making this way with the ‘real’ lemon from scratch filling (as in a pie) for many, many years. It can be done with any lemon meringue pie recipe. You just made lemon pudding pie! Try it next time with the real thing and your hubby and family will like it a lot better!! Yes-I agree with you! Not listed ingredients for the meringue. Would’nt make this if you paid me–its a cheap looking and tasting dessert. Just lemon pudding in a jar!! Whoa not sure what is up with you and Effie but the instructions for the meringue ARE THERE. I guess you didn’t read the entire post. Goodness. If you don’t like something, please stifle the urge to complain. No one likes a whiner. In fairness to Effie, I did just add those meringue instructions this past week in response to questions. However, in my defense, the meringue recipe is also included on the side of the Jello box. I felt bad at first including it since, technically, it’s not my recipe. But due to repeated requests (and less than flattering comments) I’ve amended the post. said this before, I’m not a food blogger and had no idea this particular blog post would attract so much attention! I’m a bit overwhelmed! How many jars and how many graham crackers? I have to say that as delicious as these look, the directions are a little vague and incomplete. When you’re giving cooking directions, you should be as explicit as possible. Experienced cooks will run quickly through the directions and beginner cooks will appreciate the more detailed ones. I think you have to let your readers know what size Mason Jars, and how many servings per recipe. They look as if they are 1/2 pint jars. Could you please make your recipe printable? They look delicious and would love to make them for an upcoming cookout.Also how many does one recipe make? Anybody can make a lemon meringue pie – these are attractive and creative ways to serve the pie – whichever way you go – jello pudding or scratch. Why would you put crème brulee in a bunch of little dishes and scorch the tops instead of just making one big crème brulee? Because it makes the dessert much more attractive in individual servings – I’m with the other girls – if you don’t have something nice to say – get off this blog! The look nice ,but cleaning up those jars ,not for me,It’s easier making 2 extra large pies, Takes more pie filling but the taste is really good and only two pie plates to clean,and it’s easy to make,not to say your isn’t good,but to much work LOL. So cute! These would make the most adorable teacher gifts for the end of the school year! But I too would love a few more details like how you put the jars in the oven? Did you stand them on a cookie sheet? Did you need to bake them in a pan of water? I have seen recipes for cupcakes in a jar and the directions said to place them in a cake pan with an inch or two of water so that the jars don’t crack with the heat. Did you have any trouble with jars cracking when you baked the crust or browned the meringue? Really like this idea. It would be much easier to follow if you posted the recipe in its entirety and then did the photos. the information is scattered all over the page and makes the recipe very disjointed. I can’t wait to try making these though. Lemon is my favorite pie! So sorry about that. Honestly, I’m not a food blogger and never expected this old post of mine to go crazy on the internet! But, honestly, the easy-to-follow recipe is on the side of the Jell-O box! So sorry, again, for being disjointed. I may need to recreate this with clearer instructions, etc., as you suggest. Linda, to hell with all these negative people ! I think this is a great idea, especially if you want to take them someplace like a BBQ or camping or a picnic, or even for a sports night thing. Pies are great, but this way,nobody can complain about portion size and shape or anything else. It may be a little more work, but they look a lot better than a slice of pie and I just think they’re beautiful!!! Those other folks just don’t know how to think outside the box!!! Joe. Linda, I agree with Joe……ignore the others, some people just can’t be pleased, they love to complain. If they don’t like it, nobody is making them read or make this, If they don’t like it….move on people!!!! Linda, I love this idea and can’t wait to make them. Thanks again Linda for sharing!!!!!!!!!! I have to agree with Joe – I love this idea! I was just trying to figure out what I would make to take for the dessert table for our Friday night fish dinner at the fire house – this would be a perfect “switch up” from the typical cupcake and brownie fare! I can’t wait to make these!!!! 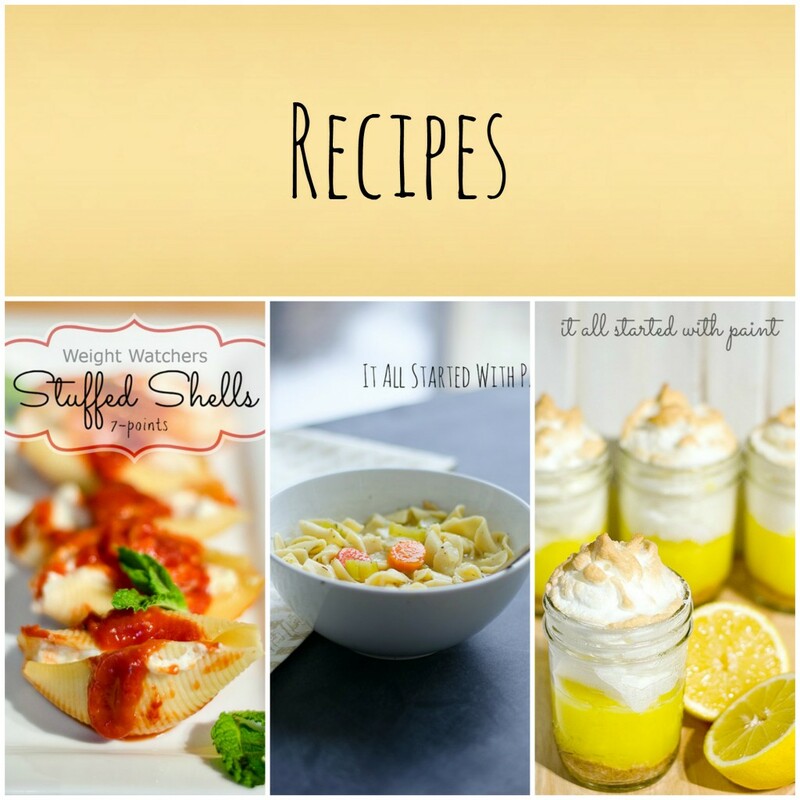 It’s huge on Pinterest, it’s on there several times and linked up through other recipe sites online. I still didn’t see an answer for how many jars/servings this is making. Did I miss it? So sorry about that. Truly, I’m not a food blogger and when I put up this recipe I never thought it would appeal to so many people! 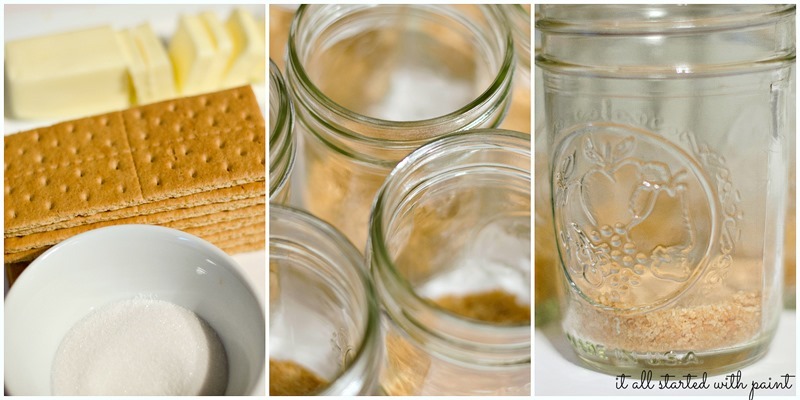 I’ve updated the post and am pretty sure I ended up with six servings using the 1/2 pint-sized wide mouth mason jars. Just made these! Love love love this! Super cute idea! These look amazing, but I think I will make my lemon pudding, since the egg yolks will be just hanging around looking to be a part of something. 🙂 Thank you for a great idea! Do you know, or have you ever tried, making these and not filling it over the top so that you can put lids on them and pack them in a cooler for a picnic? Just wondering if they hold up for stuff like that? I’m so lazy, I’d go one step further – I’d but a Nilla Wafer in the bottom. I will be making these for 4th of July! My pies in a jar are literally cooling in the oven right now.. Just one note to those wanting to make this. Meringue rises!! LOL I have never made meringue and found that out the hard way. They are as tall as the jars themselves! I would probably halve the meringue recipe, and that would be enough. I can’t wait to try them! I found that out too! But leaving it in the oven til it cools is so long! Meringue all over the place, crust was a rock, lemon filling separated and liquid, not pretty anymore! Think they need to come out after cooking and cool on top of oven??? I made your recipe this afternoon. My guests loved it! Thank you! I’m so sorry that this recipe didn’t work out for you! So very deeply and truly sorry! I made these so many years ago and am trying to remember the details. I suppose that I only let them cool for perhaps 10 minutes or so in the oven before taking them out. I hope that helps! You can always take them out right away too. I suggest the cool down because I hear rumors that the glass jars could break when subjected to extreme temp changes. But I suppose after just 10 minutes in the oven it should be okay coming out right away. I also don’t remember the meringue rising as it heated up – but again so long ago! Again, I’m so so sorry!!! I know this recipe is good and it looks cute BUT the makers of Ball jars, Jarden Corp. do NOT recommend ever putting their jars in the oven. The glass is tempered for a consistent wet heat and not the dry and varying heat of an oven. The glass is not made for this and it will alter the composition of the glass resulting in shattering or even a hairline crack that could send small shards of glass into the baked goods and be unseen. I realize people bake in these jars, but it is a very unsafe thing to do and could result in injury or loss of product. I wrote to the company and they sent me an email with this info about their jars. I wanted you to know this is not safe to avoid any problems should someone follow your directions and have a jar shatter. I am not trying to be mean or nasty in any way…just trying to save you and others from harm by providing accurate info. How much lemon pudding do you put in the mason jar. An how much meringue do you put on the top. I started to think it would be about 1/2 cup, since it’s a 3 oz box that makes 6 servings, but then realized that the 3 oz is just the dry mix, and not the quantity once cooked. Haha! I would say that these had 3/4- 1 cup of filling in each. I’m not positive though. It also depends on how thick you make the crust. Do you cook the lemon pudding part and then add the meringue or add the meringue and cook them both for 10 min ? I cooked the lemon pudding in a saucepan first. Then put in jars. While it cooled down a bit, I made the meringue and then added & cooked in the oven. Hope that helps! Do you have a printable version of this? My mom doesn’t use this recipe and I wanted to print it off for her, but it’s like 3 pages long. I loved these and I made them for our family Easter brunch. I’m writing this a little late as I just need to Warn everyone to follow the recipe as I didn’t when it came to the crust. I make gram cracker crusts for other pies and love them so I did these the same not even thinking! Big mistake—- and I pressed the crust into the bottom of the jars–even Bigger mistake! If you add as much butter this this recipe as if your making a regular pie and press your crust to the bottom your family will never be able to get it out of the jar!!!! (so sad–even if the Grandkids though it was funny) I will make these again—— BUT I will follow the directions to a T…..
Am really loving the idea of this recipe! Am hoping to make it for a LARGE group later this summer. I had some thoughts though, and wondered what you thought: Do you think it’s really necessary to bake the graham cracker crust before pouring the filling in? This is a genuine question. 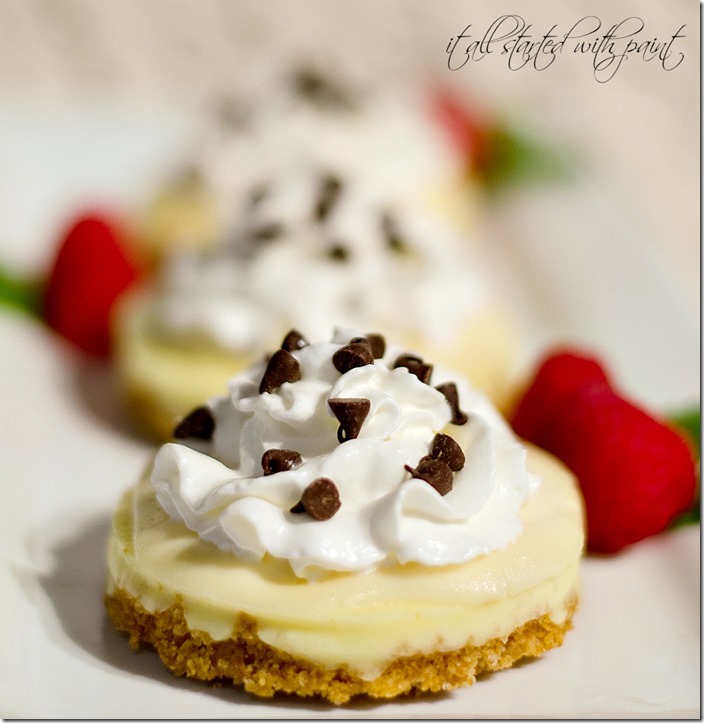 I know there are a number of recipes that utilize the graham cracker crust and do not bake prior to adding filling. Also, have you considered using graham cracker crumbs and saving yourself a step? When I tried the recipe, I had to add a little butter because the crust didn’t stick together enough. Thankfully, I’ve made numerous graham cracker pie crusts, so knew what it should look and feel like. Okay, let’s see if I answer all your fabulous questions! 1. I don’t think you necessarily have to bake the graham cracker crust first. I’m just used to that step when making a cheesecake. And it did form a hard crust when baking first. You might get some more delicious crumbly graham cracker by skipping this step. 2. I didn’t even know there are graham cracker crumbs! So, yes, absolutely!!! Trying to beat those graham crackers in a plastic bag with a rolling pin is not my favorite part. LOL! And either way, the butter added is a must to get them to stick together. 3. I prefer the pie filling because I think it’s truer to a real lemon meringue pie. Taste wise, though, I’m sure you’ll get the same taste. The only thing is not to use the version that doesn’t need to be cooked first. 4. The watery filling thing is something I’ve encountered when making the full lemon meringue pie in a pie shell. I would try to let it set a bit more before pouring. I think! …cute. Of course, then we have the “anti-meringue” people making everything NOT so pretty…..ha!